A special thanks goes to Patrick Roberts. Without his pre-hike scouting of this area this trip would have been considerably more difficult to undertake. Description: The Quehanna Wild Area is located in the Moshannon State Forest. The terrain is a pleasant mixture of a nearly flat plateau and deep ravines. The trails meander through large open heath meadows full of Blue Berries, lush forests with a thick understory of ferns and Rhododendron tunnels along the many streams. 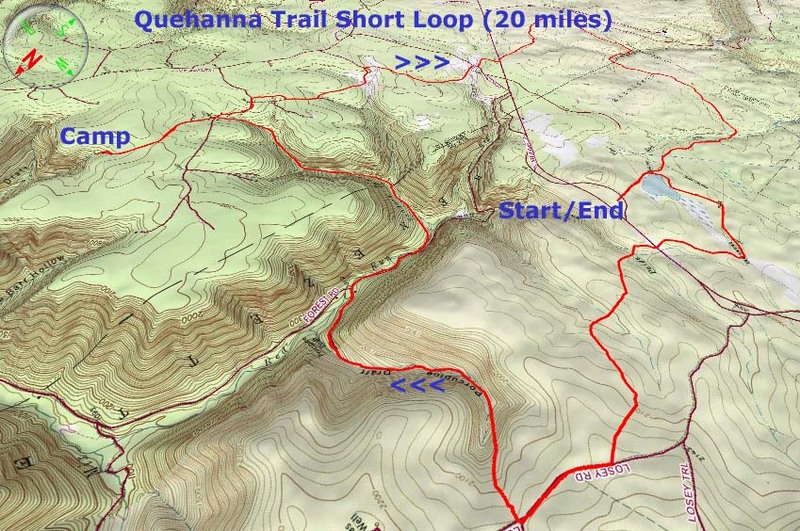 The 70 mile long Quehanna Trail circumnavigates this area. 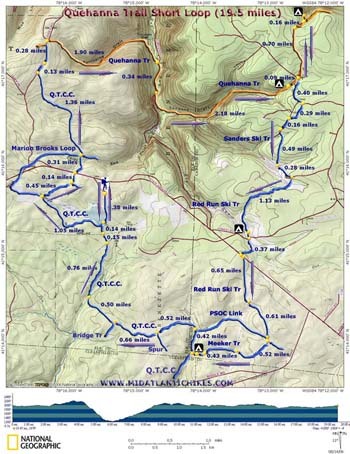 It is bisected by several connector and Ski Trails, making smaller 2 and 3 day loops … even day hikes … possible. The over-night backpack trip described here is our first foray into this wonderful area. It covers 19.5 miles and samples almost all of what the Quehanna Wild Area offers. There is one steep descent and a long gradual climb on the first day. The second day is nearly flat with only an occasional rolling hill to contend with. Safety Notes: We’ve hiked the segment of the Quehanna Tr through Porcupine Draft in August and again in October. Sometimes the stream is barely flowing but at other times the six or so stream crossings can be challenging. The trails in most of the deep hollows become overgrown with stinging nettles in the summer. Wear appropriate clothing. Trail Notes: The Quehanna Trail East Cross Connector (Q.T.C.C.) and all other foot trails and ski trails are blazed blue. The Quehanna Trail proper is blazed orange. Day 1: Follow the gravel road to the left of the kiosk. In 0.38 miles arrive at the junction with the Q.T.C.C. Turn right. Follow the blue blazes as it winds in and out of the woods and bogs. Take care as old animal trails may tempt you out into the center of the bog. The trail will always be close to the woods or in the woods. In one mile join an old woods road. The Marion Brooks Tr will go straight. You want to turn right onto a footpath at a sign post and register box to stay on the Q.T.C.C. In another 0.45 miles pass the junction of a new trail not shown on forest maps – The Lincoln Loop Tr. Soon Cross the Quehanna Highway. In 0.31 miles cross the northern terminus of the new Lincoln Loop trail on the right and the Marion Brooks Loop Tr on the left. In 1.36 miles from this junction arrive at Gravel Losey Road. Turn right here. Another blue spur trail will come in from the left in 0.13 miles. In another 0.28 miles turn right onto a footpath. You are now on the orange blazed Quehanna Tr. Descend through Porcupine Hollow. The descent will be steep and rocky at times. You’ll cross the run several times before joining an old railroad grade that will soon deposit you onto Red Run Road. Turn right here. In 0.34 miles turn left onto a footpath and soon pass a pretty little swimming hole. This is a great place for a break. Cross the run on a well constructed bridge and begin a gradual ascent up Sanders Draft Run. You will cross the run 4 times before reaching the top. In 2.18 miles from the road pass a small campsite on the right and soon arrive at a grassy woods road. To the right is Sanders Ski Tr. Continue straight across this junction on another grassy woods road. Watch for the trail to leave the road to the right at about 0.7 miles. Turn here and in another 0.16 miles bear left onto a spur trail which leads to the Arch Spring Campsite. Set your tents up around the ruins of what appears to have been an old farm. Day 2: Break camp knowing that there will be no step ascents or descents today! Retrace your steps to the blue blazed Sanders Ski Trail. Turn left and follow the grassy road up a slight incline. In 0.4 miles another woods road comes in from the right. Turn right here to stay on Sanders Ski Tr. In 0.29 miles another woods road comes in from the right. Stay straight. In 0.16 miles cross a pipeline swath. Cross another pipeline in 0.49 miles. In 0.28 miles turn right onto a Ski Tr/Hiking Tr marked by a post. This is the beginning of Red Run Tr. In 1.13 miles pass a nice campsite in the pines at the headwaters of the run, turn right onto gravel Lincoln Road. Cross a black water bog on a culvert then turn left onto another blue blazed footpath. In another 0.37 miles arrive at the Quehanna Highway. Re-cross the earlier utility swath in 0.52 miles from the last trail junction. Beware! The trail crosses over a pretty deep seep at the edge of the clearing. Arrive at another grassy woods road in another 0.43 miles. Turn right here and soon pass a nice campsite under Hemlock trees. Cross Meeker Run on a bridge and immediately turn right onto the Q.T.C.C. Follow Meeker Run for a while, passing the west terminus of the PSOC Link on the right. Just above this junction the trail will soon veer to the west and take you on a fascinating stroll through alternating deep woods and open heath meadows. In another 0.52 miles pass a spur trail on the left and then in 0.66 more miles the Bridge Tr, also on the left. In another 0.5 miles descend to and cross Beaver Run in a wide boggy area. The bridge across the run was blown out but a rock hop was created in its place. Parallel the Beaver Run Swamps for the next 0.76 miles. Cross 2 utility swaths in quick succession and re-enter the woods for just a little while. Soon find yourself on the breast of the Low Water Impoundment dam you crossed at the beginning of your trek. Retrace your steps back to the car. 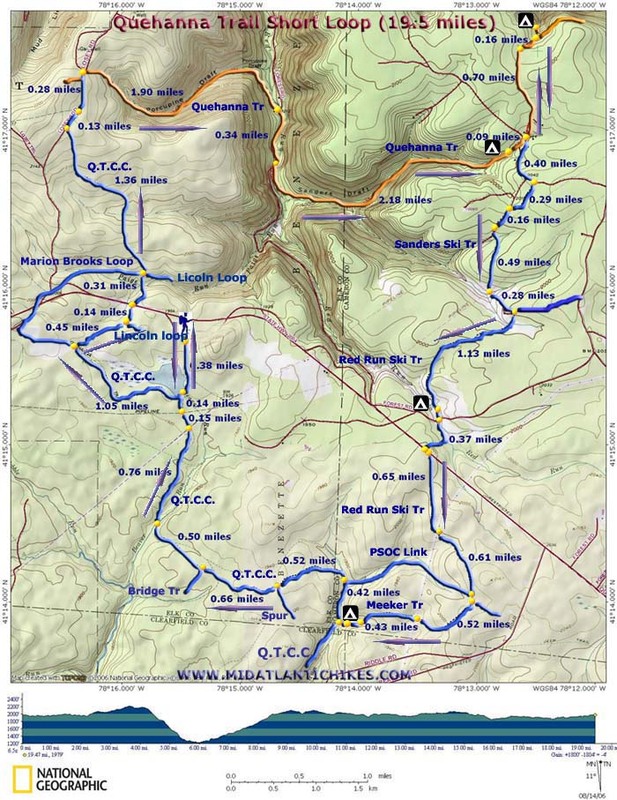 Critique: We did this hike as described in the write-up on a September weekend. Overall it was a very nice hike. The campsite at Arch Spring is interesting with the old foundation. Unfortunately the Red Run trail north of the Quehanna Highway has not been maintained and has quite a few blowdowns and places that are in danger of being grown shut in a couple years. The trails south of the Quehanna highway are beautiful because of the open meadows and are in great shape thanks to the hard work of Betty who maintains many of these trails south of the highway by herself. These trails south of the highway are definitely the highlight of the hike along with the arch spring campsite. If you camp there be sure to check out the vista a short distance away.